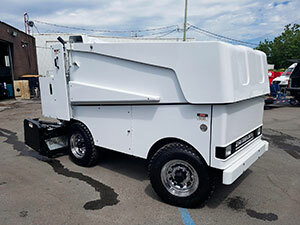 On June 13, Bedford received its new Zamboni Model 552 Electric Resurfacer. This “very special” unit, whose previous owner was none other than The Montreal Canadiens, was greatly coveted, and this is the city of Bedford who bought it last year. It should be mentioned that every two years, one of the two surfacers operating at the Bell Center is replaced by a new machine. Notice to interested parties: Canadiens’ next “almost new” 552 resurfacer will be available in the early summer of 2020!